Drew Johnson says he's eating more plant-based food out of concern for the environment. A lot of people assume a healthy diet is also good for the environment. A recently published study lends some credence to that conventional wisdom. Researchers at the University of Michigan and Tulane University looked at a large sample of Americans and what they said they ate. Researchers then looked at the nutritional value of that food. Finally, they looked and how much those foods emit greenhouse gases as they were produced on the farm. “The biology that allows them to eat grass also produces methane as a by-product which is a powerful greenhouse gas emission, 25 times that of carbon dioxide and is what really hits beef and other ruminant animals hard in the carbon footprint standpoint,” he said. 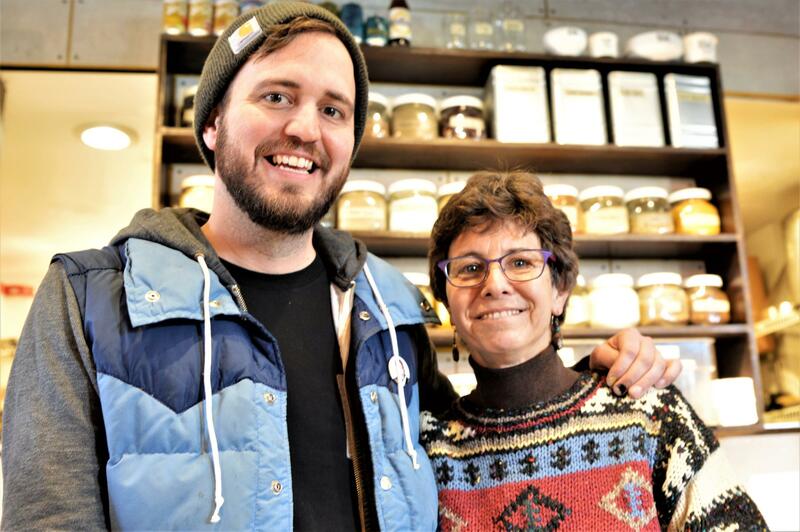 Joel Panozzo and Phillis Engelbert co-own two vegan restaurants near the Ann Arbor Farmers Market. Joel Panozzo and Phillis Engelbert co-own the Lunch Room Diner and Canteen and the Detroit Street Filling Station. Both are vegan restaurants. They often get customers from the nearby Ann Arbor Farmers Market. “They’re immediately shopping at the farmers’ market and when they’re holding their giant bag of groceries and they’re walking in here, I think that’s when they’re connecting the two. It’s like, I just bought this from the farmer that has the farm 20 miles down the road. And then, I think, that’s the moment when they ask, ‘Where are you getting your food,'” Panozzo said. “Folks are considering all the resources that have to go into the food and when you consider meat products and other dairy products, you can start to see all the amount of all of the travelling and trucking of our agricultural items all that that goes into producing a meat or a dairy product,” he said. We asked if we could meet with a couple of the Lunch Room’s regulars. Drew Johnson says he’s not vegan or vegetarian, but he’s added more plant-based food to his diet. Lester Graham: "Explain that. What do you mean ‘eat ethically’?" 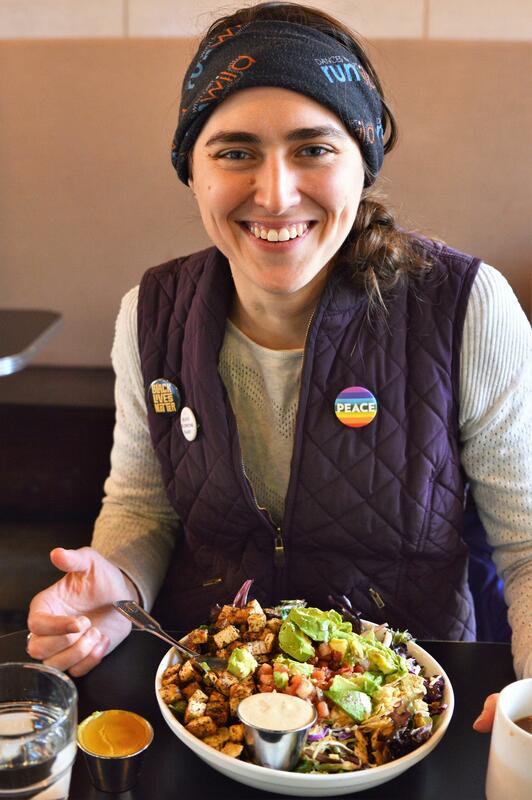 Meg Czerwinski with a vegan salad at the Lunch Room Diner and Canteen. “We think a lot about the upstream effects of how the food is produced and how much carbon is emitted getting onto our plate, but there’s also the consideration of the more vegan and vegetarian diets being healthier and decreasing in healthcare carbon emitted because our healthcare system uses immense amounts of energy,” she observed. There are a couple of caveats the researchers note: Some of the low-emission foods are not all that healthy, such as added sugars and refined grains. And while plant-based diets are considered more healthy, they can be lower in some nutrients such as iron and calcium. “In general, we’re not eating very healthfully here in the U.S. There certainly are opportunities for us to both improve the nutritional health of our diet along with reducing the environmental impact associated with providing that diet,” Heller said.